Bransford Webbs has a long and proud history with apprenticeship schemes, dating back to the late 1980’s, with a number of our current grower, supervisory and management staff beginning their career in this way. 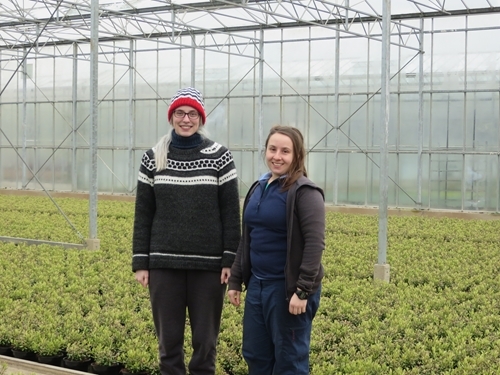 Isobel Watson and Amelia Broome began the new level three horticultural technician apprenticeship with Bransford Webbs late last year. The scheme is run in conjunction with Pershore College, part of the Warwickshire College Group, and other Midlands Based Growers. Isobel will work in a variety of nursery departments over the next two years, whilst Amelia will be based in the Propagation unit. They will attend five separate week-long study sessions each year at Pershore College. Bransford Webbs currently have two second year apprentices, Poppy Griffin and Thomas Everard, who are due to complete their course at the end of August 2019. “The apprenticeship schemes, running here since 1989, have been extremely successful for Bransford Webbs”, commented Karl O’Neill, Propagation and Technical Manager, who is mentor to the current apprentices. “This new level 3 qualification is a very exciting opportunity for both Isobel, Amelia and Bransford Webbs”.